Supporters of Antioch School Board Vice President Debra Vinson spoke and brought signs to show their support for her at the board meeting on Wednesday, August 23, 2017. 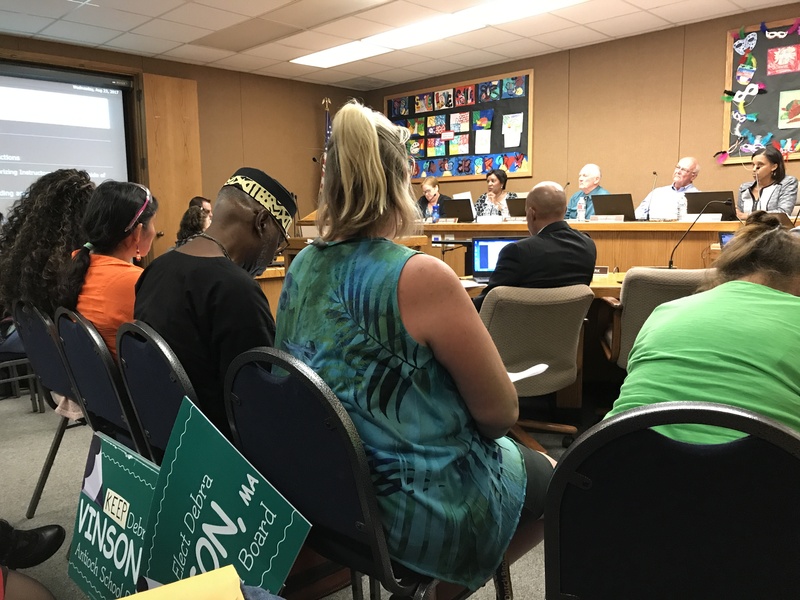 On Wednesday night, the Antioch School Board voted 3-2 to discipline Board Vice President Debra Vinson over allegations by school employees of harassment, intimidation and bullying from earlier this year. Following a two-month investigation by an outside law firm, in which Vinson did not participate and offer her side of the story, Board President Walter Ruehlig, and Trustees Diane Gibson-Gray and Gary Hack voted in favor, while Vinson and Trustee Crystal Sawyer-White voted against the motion. The investigation was requested by Ruehlig, who as President is the only member who can communicate with the board’s attorney. The process could have remained confidential, but Vinson requested the matter be taken out of closed session and into a public meeting for discussion. I regret the untimely coordination of a meeting with my legal counsel which came too late for the investigator. My attorney and I attempted to contact Ms. Maddux to set up a time to talk. It is unfortunate that we were not able to coordinate an agreed upon time with the Investigator based on availability and work schedules. I do not agree with the findings, accusations and the conclusion of the investigation. I would never intentionally intimidate, bully, demand, or disrespect anyone. I strongly believe that we should provide excellent customer service as a district to our community of parents. I find it perplexing that I am accused of coming across as intimidating. I also need to say plainly that I do not believe that any Board policies were violated knowingly and with intention and find the definitive conclusions to be strongly injurious, subjective, opinionated and biased. Since the district paid more than $20,000 for this investigation, and I am the accused, the district and its investigators have a duty and obligation to disclose the names of the accusers. The investigators report redacted all names, except mine, and the Investigators findings are based on statements of district employees who may have been coerced into giving a statement. I have always tried to have a positive working relationship with district staff and recognize that I was elected to serve the people that voted for me. On this particular situation, I forwarded the parents email to the Superintendent and was directed by her to speak to the employee to whom she delegated the work/intradistrict transfer request to. Though I felt hesitant in following the Superintendent’s direction, I reached out and had a brief chat with two employees; both immediately expressed their opinion. My short conversations with the employees centered on questions around “how they could help the family and asking if anything could be done”. At no time did I demand with any forceful communication that they “had to follow” through on a request for any specific school. I continued to communicate with the Superintendent and the Board President to ascertain if it was going to become an agenda item. No suggestions were made. I shared my concern to our District Superintendent about the safety issues that the parent expressed. To this date, I do not know how the matter ended; was the student placed at the school site that the parent requested? The Superintendent ultimately informed me that the matter was resolved “per standard procedure.” Therefore, I had no direct involvement in finalizing the process followed by our superintendent. My only involvement was to address the parent’s concerns with the Board President and Superintendent and I followed the directive given by our Superintendent. Ultimately, the district process and final decisions rest on our Superintendent and AUSD policy she followed. All I was doing was my duty in the role of serving people as an elected official. It is true, that I put parent’s needs and concerns over any partisan issue and have not crossed over any boundaries in my role as a Trustee. My passion and strong belief for an inclusive and equitable school community as a Board Trustee. All I was doing was my duty in the role of serving the people as an elected official. In February, 2017 the Antioch Unified School District received a complaint from employees alleging that they were directed by District Trustee Debra Vinson to transfer a student from one school to another in the District contrary to District Board Policy 9200/9005. On receipt of the complaint, the District retained an outside, neutral investigator, Deborah Maddux of the Van Dermyden Maddux Investigations Law Firm. During spring 2017, Ms. Maddux conducted an investigation of the complaint, which included interviewing witnesses and reviewing documents. Ms. Maddux completed the investigation and submitted her investigative findings to the District in June 2017. The District issued copies of the investigative findings to the complaints and Trustee Vinson. The motion made by Gibson-Gray and seconded by Hack was as follows: Directing Board President Ruehlig to send a letter to Trustee Vinson directing her to communicate inquires or requests for information or documents solely to the Superintendent, and not to communicate directly with other District office staff and site administrators unless authorized by the Board to do so for a time period of six months; Directing Board President Ruehlig to send a letter to the Complainants and other administrative employees letting them know that they are not required to respond to direct inquiries or requests from Trustee Vinson, but instead may refer her inquiries or requests to the Superintendent for handling; Board President Ruehlig to work with legal counsel to prepare a censure resolution against Trustee Vinson which would be presented to the Board for action at a future Board meeting. Please check back later for more details, including comments from the public, Vinson and other board members. This entry was posted on Thursday, August 24th, 2017 at 11:13 am and is filed under News, Education. You can follow any responses to this entry through the RSS 2.0 feed. You can leave a response, or trackback from your own site. If she is allowed to stay in her position, then there is no hope for Antioch. Another example of what’s wrong with this city. People who do bad in Antioch are protected. Nothing happens to the bad guys. The administration is corrupt. Debra is asking questions that people don’t want uncovered. They want to get rid of her. They have spent your money to do it. For them, it’s not about the kids. It’s about power. Debra is for the kids. You’re right. Nothing happens to the bad guys. Facts speak for themselves. All government is run by public money, that’s obvious and really nothing but a straw man fallacy. Vinson needs to go before someone sues the district for harassment. Then more “tax payer” money is thrown out the window, eh SJ? Vinson is a liability and needs to go before it gets worse. Wonderful. I am glad 3 of them voted to discipline her. Vinson is not for the children when she bullies the adults. I don’t want her anywhere near my kid since she acts that way. I read what she actually said and did and I am appalled she thought she could get away with it. I will not vote for the woman who stood by her Crystal Sawyer white. And Vinson didn’t even recuse herself on a matter relating to her. That is not only hilarious but corrupt with a little bit of conflict of interest! SJ I admit the administration and school board often leave a lot to be desired but in my book Ms. Vinson is NOT for the kids at all. But, she also does not support our teachers one iota. Electing her was one big mistake from day one. She is a very divisive person. Regardless of what happened, to get this investigation started. The excuses are UNBELIEVABLE and just not credible to any thinking person. If Vinson didn’t think the investigation was worthy of her participation then she should have said so.